If you’re in a relationship where one of you enjoys the great outdoors and camping, but your partner does not take kindly to backpacking, sleeping bags, bugs, snakes, dehydrated food and no “facilities,” then glamorous camping may be an answer for you. Glamorous camping also known as glamping is not really new, but today’s post will give you a little background and serve to assist those who may want to consider “glamping” as a business opportunity. 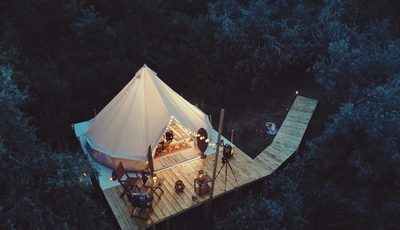 In 2013, USA Today published an article “Posh touches luxe up ‘glamping’ trend.” Interestingly, some glamping sites started to appear in 2005, but in 2013 there were no clear statistics about the exploding industry, no glamping trade association and the Outdoor Industry Association was not charting “luxury camping” statistics. As we all know, it is one thing to enjoy products of a business, quite another to own the business producing those products. It is not unusual for people to experience something new, like glamping, and dream about getting into the business. If you have moved from the dreaming stage to the planning stage considering creating a business plan, purchasing the land, engaging partners, securing financing, applying for permits, hiring a designer, retaining building contractor, then you most certainly want to meet with your insurance agent. This will allow you to have a clear understanding for protecting your business and minimizing your risks. At John Bailey Company we offer specialty insurance for those unique items or events rarely covered by standard policies. Additionally, we specialize in the Campground insurance marketplace. We are the only insurance agency in the country to partner with a past RV Park insurance underwriter for Gillingham & Associates, the past managing general agency for Arch Insurance and Gulf Insurance. We know the campground market, as our program administrator has competed against the competition in rating, underwriting, and now as an insurance agent. If you’re considering owning a glamorous campsite, our team would love to talk to you about your specialty insurance needs.